Kōsaka Kirino has everything a middle-schooler could possibly desire, and what she does not have, she gets. Beautiful, smart, and athletic, she is the target of envy of all those around her, but still has a loyal group of friends to hang out with. She also stores a mountain-sized stash of adults-only siscon merchandise in her closet, something she has to keep hidden at all costs. Life taught Kirino to fight for what she wants with her own two hands. But if there is one thing she cannot get just by trying hard enough, it is social acceptance for her hobby. Even people as incredible as her fear rejection. 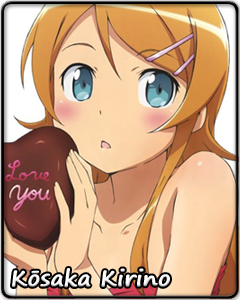 For Kirino, this means an internal war between who she wants to be and who she really is. Kōsaka Kirino has no intention of backing down from the challenge ahead of her. But what she needs right now is something she has never had to do before. She must learn to accept others, imperfect as they may be, as her friends and equals. She must swallow her pride and ask for help. Most importantly, she needs to start trusting the people closest to her. But nobody with Kirino's fiery personality would just humbly accept all those lessons. Kirino's temper is sure to make things difficult for her and all those around. But as they say, no pain, no gain.